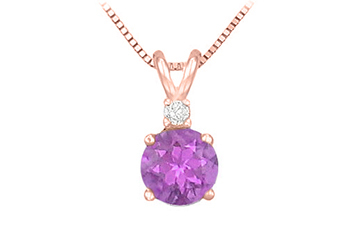 This amethyst solitaire pendant features luscious purple brilliant cut amethyst prong set over polished 14K rose gold chain and is topped with a brilliant cut diamond. This gemstone solitaire pendant can be availed in various metals such as 14-18K yellow gold platinum and sterling silver. Valentines Day gift.